Simple. Selfishly, no one wants to be wrong. Take it back to Adam and Eve. After Eve listened to the serpent and God confronted both Adam and Eve about what they had done, what's the first thing they do? Blame someone else. Genesis 3:12-13: "The man said, 'The woman you put here with me—she gave me some fruit from the tree, and I ate it.' Then the LORD God said to the woman, 'What is this you have done?' The woman said, 'The serpent deceived me, and I ate.'" You see, if you blame someone else, you're not really at fault. It's far easier to blame your parents or your neighborhood for your personality, fears, or habits today. More excusable that your spouse is unloving and ignoring your needs as why you had an affair. More palatable to blame your schedule, time demands, or stress on your poor eating habits. If you blame someone or something else, you don't have to take responsibility. And you ultimately don't have to take the blame (for your needing meds, getting divorced, or being overweight) either. Therefore, you're not wrong. Larry Ross, President of A. Larry Ross Communications, articulated this point well. "Sin is a word so seldom used in our culture that society has almost lost any point of reference from which to acknowledge or embrace the concept. In an effort to rationalize away bad behavior, immoral activities are often downgraded to mistakes and indiscretions, or responsibility blame shifted to one's upbringing or another individual." Since we're talking about Scripture and faith, a great example of not wanting to be wrong with religion can be found with Brit Hume's humble suggestion that Tiger Woods embrace Christianity. What has his suggestion to Tiger produced? Tom Shales, a Washington Post Staff writer, suggested Hume should apologize. "You gotta (apologize). Just say you are a man who is comfortable with his faith, so comfortable that sometimes he gets a wee bit carried away with it. If Hume wants to do the satellite-age equivalent of going door-to-door and spreading what he considers the gospel, he should do it on his own time, not try to cross-pollinate religion and journalism and use Fox facilities to do it." MSNBC's Keith Olbermann said Hume should "keep religious advocacy out of public life since, you know, the worst examples of that are jihadists, not to mention, you know, guys who don't know their own religions or somebody else's religion like Brit Hume." MSNBC's David Shuster suggested that Hume denigrated Christianity by sharing his faith. Homosexual activist Dan Savage said, "American Christianity has been hijacked by the lunatics, by the Pat Robertsons ... and by people like Brit Hume, and it's an insult to Christianity, it's an insult to Christians." Even Welton Gaddy, Pastor of Northminster (Baptist) Church of Monroe, Louisiana said, "I am not pleased to see my faith used in a utilitarian manner whether the issue is personal forgiveness or national politics. Unfortunately, the manipulation of faith has become so common that to many it now seems acceptable." Condemning and yet complimentary in his article, Brad Hirschfield found Hume's remarks about Buddhism "shallow" and that Jesus being the only way to a better life "ridiculous." Lisa Miller suggested Hume was "using his platform and airtime to offer Tiger some free advice." Stuart Roy on the Hill's Pundits Blog educated readers that Hume not only was doing his job as an analyst offering his insight, opinion and views on the topic (Tiger Woods) at hand but also that with Christianity, one seeks forgiveness from God which isn't offered in Buddhism. Therefore, his analysis was correct. Speaker Dan Calabrese wrote about the hypocrisy, "If a celebrity’s life goes into a spiral, and we kick back and watch while munching popcorn, that’s acceptable. But if someone suggests an actual path to changing that person’s life – particularly a path that leads that person to God’s redemption – well then, mister, you’ve crossed the line." Demi Bardsley of Concerned Women for America, put the issue into perspective. "Brit Hume would not be viciously criticized if he had claimed the benefits of any other religion or non-religion. It's only when a Christian speaks of the advantages of Christianity that the modern secularist goes into orbit. No Christian should silence himself from a truth known deep in his soul. Brit Hume is to be commended for his courage to speak up and take the heat. All for a very simple idea -- that God loves us and can turn our broken lives into something better, something we could never have imagined." No one wants to be wrong. You either believe the same as Brit Hume - that Jesus Christ is the way, the truth, and the light and that no one comes to the Father but through Him...and Tiger needs to ask forgiveness for his sins to receive Christ's forgiveness and love - or you believe there are other ways to do this. Forget whether or not Hume should've shared the advice at that time, on that program, or in his role. You either believe what he said is correct or wrong. Talking religion can travel down many side-streets but ultimately the foundational question to be answered is do you believe the Bible? From there, one can debate the depth and maturity of their belief, what's shaken or strengthened their faith, and more. But, again, no one wants to be wrong. 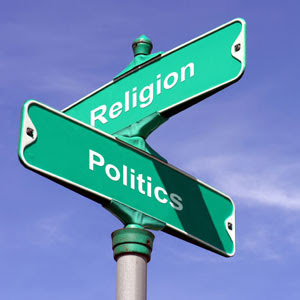 While some restraint may be used in disagreements with religion, discussions of politics can simply turn ugly. Without spending time collecting links and sharing stories on this topic, one could simply return to the 2000 Presidential Election to highlight the division of the country's opinions with the narrow victory and all the voting issues. One could examine the erosion of bipartisan and American solidarity that had been so rampant in President George W. Bush's first term to it's decline in the 2004 elections to the vicious, evil, and hateful venom spewed at the Bush Administration through much of its second term. Flash-forward to today with topics such as health care reform, T.E.A. parties, stimulus bills, bailouts, czars, and so much more. The political landscape seems maddening. But beyond not wanting to be wrong, people know little about the politics and religious subjects of which they fume so passionately. We want to be on the winning team and to have our beliefs and opinions validated.Yet, we don't spending enough time in Scripture and prayer or accepting a personal relationship with Jesus Christ. Or we listen to only one political source of information without researching the topic or aligning it with our moral beliefs. Instead of being about to debate or discuss, we readily argue like little spoiled, selfish, undisciplined children. Everything is drama. Everything is an argument. Emotions and tempers flare and nothing is resolved. At least with a debate or discussion, two parties can walk away possibly learning something new. At the very least, the two sides agree to disagree. But little is learned from arguments. The goal is to hurt and see which side can not listen to the other and shout the loudest. We don't want to be wrong. We don't want to learn enough to realize if we're right or wrong. Politics, politicians, and Presidents won't save us. But faith in Christ will. In Him, you won't be wrong and you'll always know little...but He'll keep growing you...if you're willing to be willing. It wasn't always like this. In the days of our founding fathers and the days of great statesmen, men and women would gather. The women would talk about their children, cook and sometimes even talk about voting and things of that nature. The men would have rousing debates about politics. Maybe we need to go back to those days. Anonymous, thanks for sharing your thoughts. The key is that people talk and not be fearful of being judged, shouted down, or labeled just because they have a differing view.